TOKYO, Japan, March 11, 2012 (ENS) – Japan stopped for a moment on Sunday to mark the one-year anniversary of the earthquake and tsunami that leveled northeastern Honshu Island, left 16,000 people dead and 3,000 others missing, and precipitated the world’s worst nuclear crisis in 25 years. A moment of prayerful silence was held across the country at 2:46 pm, the precise time the 9.0 magnitude quake occurred off Japan’s Pacific coast on March 11, 2011. In Tokyo, about 1,200 people, including the Emperor and the Empress, Prime Minister Yoshihiko Noda and families of the victims, attended Sunday’s ceremony. Emperor Akihito, 78, who had heart surgery February 29, told the crowd that it is important to pass on the experience to future generations, to raise awareness of disaster prevention, and to build a safe country. Memorial services also were held in the three prefectures hardest hit by the disaster – Iwate, Miyagi and Fukushima. About 2,500 people, including Miyagi Governor Yoshihiro Murai, gathered for a memorial in the city of Ishinomaki, Miyagi, which counted 3,182 dead and 553 others missing, the greatest number of casualties for a single municipality. 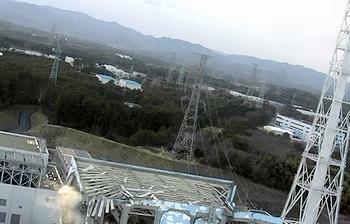 When the earthquake and tsunami struck, Tokyo Electric Power Company’s Fukushima Daiichi nuclear power plant lost off-site power, throwing out its primary and backup cooling systems. The nuclear fuel overheated despite company efforts to pump first seawater and then freshwater in to cool it. Hydrogen gas built up and exploded, blasting open four of the facility’s six reactor buildings and spreading radiation far and wide in air, soil and seawater. Two of the six reactors were already shut for maintenance. The other four shut down automatically as designed, but nuclear fuel requires continued cooling even after a plant is shut down or it melts down, releasing radiation..
Nuclear meltdowns at three of the six reactors at Fukushima Daiichi went officially unacknowledged for months. Nuclear regulators said in early June 2011 that inspectors had found tellurium 132, telltale evidence of reactor meltdowns, just a day after the tsunami but did not tell the public for nearly three months. 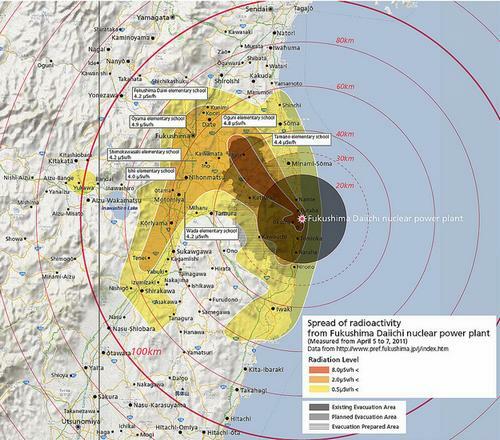 The Japanese government ordered everyone within 30 kilometers of the damaged nuclear plant to evacuate and opened shelters for evacuees in schools and public buildings. As of September 2011, more than 100,000 Fukushima Prefecture residents were still subject to evacuation measures that force them to live far from their home towns and cities. As of February 23, there were 62,674 Fukushima residents who were still displaced from their homes. Some places near Fukushima Daiichi are estimated to be contaminated with accumulated radiation doses of more than 500 millisieverts a year, lowering residents’ hopes of returning there soon, if at all. Tokyo Electric Power says that to date the company has paid nearly 450 billion yen, or about US$5.4 billion, to people harmed by the nuclear crisis. 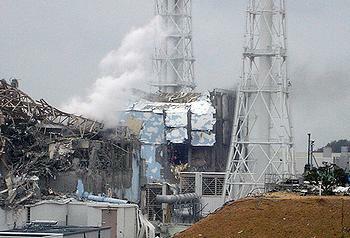 Tokyo Electric Power Company, TEPCO, said only about 40 percent of those entitled to apply for compensation have done so. Survivors applying for benefits have said the process is too slow and complex and the company lacks compassion. TEPCO President Toshio Nishizawa visited the plant on Sunday, where he joined about 200 employees in a moment of silence at 2:46 pm. 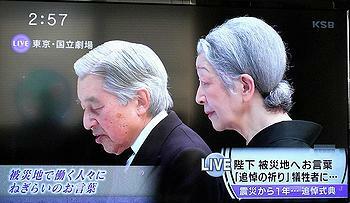 Nishizawa expressed “heartfelt sympathy to all those who passed away and their loved ones. Our thoughts and prayers are with them and also with those people who continue to be affected by the terrible events that unfolded on that tragic day,” he said. Memorial prayers and good wishes poured in from around the world. UN Secretary-General Ban Ki-moon took part in an event in New York on Thursday evening, organized by the Japan’s Permanent Mission to the UN to mark the one-year anniversary. In Vienna, Director General of the International Atomic Energy Agency Yukiya Amano, who is Japanese, said the international community had learned many lessons from the accident, which has helped make nuclear safety stronger than it was a year ago. “Fukshima Daiichi was a very serious accident, but we know what went wrong and we have a clear course of action to tackle those causes – not only in Japan but anywhere in the world,” Amano said. He said that countries around the world are searching out weak links in their own nuclear safety systems and taking action to strengthen them.